If you have read my previous blog on the ideal body fat percentages for male and female hockey players, you will know the how and why male hockey players should be around 8-12% body fat and females should be aiming for 15-18% body fat. Yes, that’s absolutely correct at the most basic level possible. But, I can also drive my car with my hands on my lap and my feet on the wheel. Just because I can do it, does that mean it makes any sense? Better yet, if you’re an athlete looking to improve your sport performance while simultaneously changing your body composition, aren’t you going to want to control for all potential variables during the process so you get the most targeted result? Let’s dive in and review the difference between good and optimal. First and foremost, nobody is going to be optimally changing their body composition without paying close attention to their nutrition. 1. Controlled eating ensures you are eating in a caloric deficit. Without this, you will never lose weight no matter how much you train. You can’t out train a bad diet. 2. Ensure you still have adequate energy levels to train hard even when you’re in a caloric deficit. 3. Allow you to maintain the maximum amount of lean mass and strength possible while leaning down. 4. 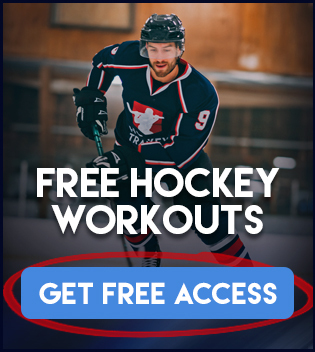 Allow you to still perform on the ice at a high level, most likely at a better level even though you are in a caloric deficit since you are dropping body fat. Less fat = more speed and more conditioning without changing any other variables. 5. Maximize recovery. Recovery boils down to Sleep → Calories → Carbohydrates → Protein. Probably in that order too. 6. Maintain optimal hormone and immune system function while losing weight. When it comes to body weight regulation, nothing is more important than caloric intake. Anybody who tells you calories don’t matter either doesn’t understand science or is trying to sell you something. Calories have been the #1 regulator of body weight for several decades of research, that’s not ever going to go away. At its most basic level, it boils down to energy balance (energy in vs. energy out). • Thermic Effect of Feeding (TEF): Amount of calories burned through digestion. For example, protein has an average 20% TEF through digestion. So to consume 100 calories of protein, an average of 20 calories of that intake would be burned off simply through digestion/absorption. • Basal Metabolic Rate (BMR) / Resting Metabolic Rate (RMR): Many people use these terms interchangeably which is not correct, but in any case that doesn’t matter here. What this represents is the amount of calories you burn through daily bodily function. All of the things your body needs to do to maintain optimal function and keep you alive. • Thermic Effect of Activity (TEA): TEA refers to calories burned through formal exercise such as weight training, conditioning, etc. • Spontaneous Physical Activity/Non-exercise Activity Thermogenesis (SPA/NEAT): SPA/NEAT represents a more subconscious form of physical activity caloric expenditure such as walking, fidgeting, getting up from a seated position, tapping your foot, etc. Keep in mind this is a VERY simplistic overview of the above as although I do feel it is important you to know the variables, it isn’t necessary or plausible for me to go over each aspect in the full detail I should in an article strictly on weight reduction for sport performance. But just know in your mind that calories are king to weight reduction and that none of the above are static. All forms of Energy In VS. Energy Out are subject to change every single day for many reasons that I won’t go into here, but it is these reasons why people without a true understanding of everything that goes into the equation feel it’s not accurate. If there is enough demand I can make a super “sciency” article in the future going over it. But my guess is that few people are as big of a nerd as I am and they just want to know the “how” instead of the “why”. Maintenance: Where the Energy In equals the Energy Out and therefore the body has no change in body weight. Hypocaloric state: Where the Energy In is less than the Energy Out and therefore the body will lose weight. Hypercaloric state: Where the Energy In is greater than the Energy Out and therefore the body will gain weight. Now here is why it is the most important aspect to consider whenever jumping on any weight loss regime. If you aren’t in a hypocaloric state, you will not lose weight no matter what you do. Meaning, you can be eating great foods, training hard, taking the right supplements, having your food at the right times, and getting a great sleep every night — and still I promise you, you will never lose a pound. Because your energy equation is off. It’s impossible to lose weight if you’re taking in the same amount that you’re expending. Your body weight will go nowhere. You will simply be maintaining your mass. This is normally the state people are in when they are either plateauing in their fat loss OR even their weight gaining efforts. If fat loss is your primary objective, calories also have to be your primary objective. I can tell you that although calories are the major body weight regulator, they won’t determine the tissue specificity of that weight within the person. Meaning, calories just regulate body weight. But the type of training you do, your genetics, and the macronutrient split you use to make up your “allowed” calories will determine your tissue-specific body weight which is how much lean mass vs. body fat you are carrying. Body weight and body composition are two very different things. Carbohydrates: 1-2g of carbohydrates per pound of body weight per day on training days. Fat: Fat will simply make up the rest of your calorie allotment. Having the proper distribution of macronutrients is vital to your success in your lean down journey. Calories, although king of body weight regulation, do not mean everything. A good example of this would be to compare 2000 calories of eating pure sugar every day in comparison to the 2000 calorie diet laid out above. Who do you think is going to be healthier, perform better, retain more muscle mass and look better? As far as timing is concerned, I am not going to dive too deep into this as this would turn into more of a book than it would a blog post. Just keep in mind protein should be had in even quantities throughout the whole day, post-workout protein in no way shape or form has to be a large dose. The most important aspect is to ensure a steady stream of amino acids throughout the whole day. Ideally split across 4-6 meals. Carbohydrate intake on training days is best eaten pre-workout, during training and within the 6hrs after training for reasons I discussed in the game day nutrition article. Fat timing is quite simple. Just keep it away from the pre/during/post-workout window. For the same reasons as discussed in game day nutrition. Again, 4-6 meals per day is optimal for meal plan design. Initiating your lean down process and Lean Body Mass (LBM) x 13 should be a great start in healthily kick-starting your weight loss although if you run into plateaus down the road, adjustments may need to be made. First and foremost do not reduce calories further unless you are training 5 – 6 days per week, following the diet at least 90% of the time and making sure you are accurately accounting for all calories. Sometimes liquid calories, sauces, and cheats on the weekend throw off your energy equation. Ensure you are very accurate before creating a new deficit. It is always best to eat as much food as you possibly can while still losing weight. Although if you run into a plateau while eating LBM x 13 + training often + following all the above rules — an additional deficit may need to be placed. In this scenario, I never recommend introducing a new deficit greater than 10% of your current calories. You should always be conservative with these and the deficit should never need to go below your BMR. Last but not least, guidelines for rate of weight loss for hockey players should never exceed 1-2lbs per week. This is a perfect rate of healthy, good weight loss. Going any more than that can have detrimental effects on your muscle mass and performance. Keep it in that zone and if it falls out of that zone, adjust your calories accordingly. From a training perspective, you would be surprised to know that it shouldn’t change too much. The most important thing to keep in mind is that you still must train like a hockey player. The last thing you want to do is train like a bodybuilder or like a marathon runner to start losing weight. This isn’t you and this isn’t what you want to do. 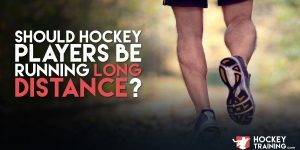 Training in this fashion puts you at a potential risk for loss of development in the muscles important for hockey performance. For example, performing the amount of aerobic work marathon runners do puts you at great risk for losing muscle mass in many different areas in the body. This is not what we want, we want to maintain as much muscle mass as possible because hockey is a game dependant on strength and power. In another example, if you take up training like a bodybuilder you are missing the point. You are not in the weight room to be a better weightlifter, you’re in the weight room to be a better hockey player. Bodybuilding training, although great if you are trying to be a bodybuilder; often lacks in athletic structural balance, internal/external rotator cuff work, VMO exercises and choosing exercises that enhance mobility. Hockey player’s need all of these things to improve their game while they are changing their physique and it’s something that other programs won’t offer because other programs aren’t designed to improve hockey performance. At the end of the day, the most powerful weapon by far in weight loss is calories. If you have ever looked at how much exercise it takes to actually create a 500 calorie burn you would realize how weak of an effect on weight loss exercise actually has. Calorie reduction via “energy in” is a much more effective and simple way to illicit weight loss which is why I take a slightly different approach with my hockey athletes. I actually don’t want my hockey players training lighter, or with more reps, or with circuits (circuits can be passable but only if they are energy system specific) or any of that stuff while leaning down. It’s just not necessary, and not only is it not necessary but you could actually lose more muscle in the process training that way. A combination of 4 well-designed weight training sessions per week, 1 high-intensity conditioning session + 1-3 low-intensity tempo runs are well more than enough to get anybody shredded, let alone just lose some weight. To wrap things up, being lean is absolutely essential to performing at your best on the ice and ensuring you are training and eating properly for hockey performance is ideal in any scenario not just leaning down. You have to train and eat like an athlete year round regardless of the goal at hand and even when the primary goal is to change your body composition, everything you do to achieve that body composition should still be based around hockey performance training decisions. I am trying to drop some weight. I am fallowing the next level performance system and I am weight training 4 times a week and doing the speed and conditioning as written in the next level speed system. My question is what are my training days v non-training days? For example, If I am just doing a 30 min conditioning, does that count as a training day? Let me know your thoughts on this! Hey Tyler, thanks so much for the support. I keep it real simple with my athletes here. If you’re hitting your weekly targets for weight loss, keep doing what you’re doing with the meal plans I have provided especially if you are finding comfort in adherence. But if you are running into plateaus, best case scenario is that you only run training day meal plans on the days that you strength train. Not when you perform conditioning or speed work. I found this article so useful. I santidad to ask, when you explain how should it be the lean down training, are you talking about off season or we have to combine those workouts with hockey practises? Hi Sara, this would be done during the off-season in most cases.